Another few months have flashed by, and it’s time for a quick status update from the LBNF/DUNE project. Since my last update in May, the LBNF team has been very focused on getting in place the “CM/GC” contract, the contract that we plan to use to accomplish the conventional facilities construction at the project’s far site. CM/GC is short for “construction manager/general contractor” contract. I admit it doesn’t exactly roll off the tongue. Using a CM/GC contract will be a first for Fermilab and represents a novel approach to address some of the project’s unique challenges at the far site. Of course, there will be a substantial amount of excavation (800,000 tons of rock!) to create the three massive caverns and supporting drifts that will support the DUNE experiment. Under Secretary Franklyn Orr and team visit the drift that will lead into the LBNF/DUNE site. Photo credit: Walter Wenning. But even more of a challenge will be coordinating all of the underground construction work. In addition to the excavation, tasks such as building two cryogenic systems, erecting four six-story-tall cryostats, installing the neutrino detectors and filling the cryostats with liquid argon (all through a mile-deep shaft that, at its largest is only 5 feet wide by nearly 13 feet deep). That’s where the “CM” in “CM/GC” comes in. A key role of the selected contractor will be to provide construction management services to help the project complete final design and then, when our partners are ready, help coordinate installation of the massive cryostats, cryo systems and neutrino detectors. We’ve made a lot of progress in getting the CM/GC contractor on board in the past two months. In late June, we received official approval from the DOE Office of Science’s senior contracting official to use the CM/GC acquisition strategy. We put the contract “on the street” the next day (actually, we just posted it on the federal contract opportunities website) to enable potential contractor partners to begin to review the contract, plans and specs. Then, a couple of weeks ago, our procurement team organized a preproposal meeting out near the site in South Dakota. 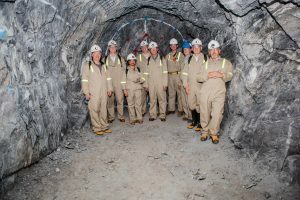 We were pleased that more than 50 people showed up from a variety of contracting and construction management firms to participate in the meeting and get a firsthand sense of the work by touring underground at Sanford Lab. Chris Mossey is the Fermilab deputy director for LBNF.